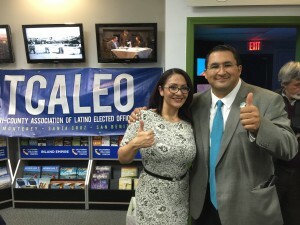 California Consulting LLC Orange County Business Associate, Ana Gonzalez, attends the TCALEO Event - California Consulting, INC. Recently, California Consulting LLC’s Orange County Business Associate, Ana Gonzalez, attended the TCALEO event in Salinas California. The Tri-County Association of Latino Elected Officials is an organization of Latino elected and appointed officials of Monterey, San Benito, and Santa Cruz Counties. Ana Gonzalez is with City of Modesto Councilman and TCALEO President Tony Madrigal.